ShowSpace lets you to painlessly gather and display products from all over the web in one central, beautiful, and SEO friendly storefront. It’s completely tailored to smart affiliates who want to add value and make money through product gallery websites. You focus on what you’re good at, ShowSpace does the rest. 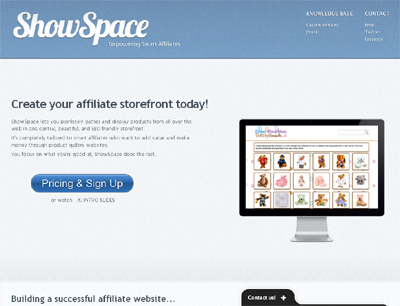 ShowSpace was build to vastly simplify the creation of affiliate storefronts. It uses cutting-edge technology (HTML5, CSS3, Amazon S3, Backbone.js) and takes care of statistics, product prioritization, and automatic updates to product details, so you can focus on adding products and promoting the storefront.